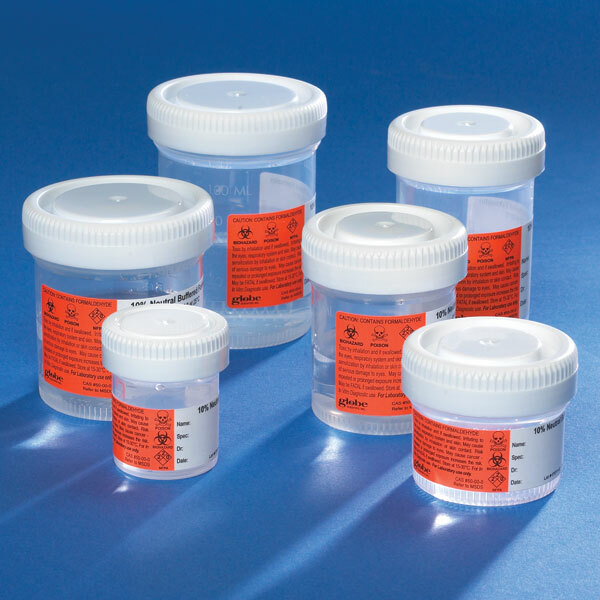 Globe Scientific's formalin filled containers offer one of the best leak-resistant and air-tight closures on the market. The containers are prefilled half way with 10% neutral buffered formalin. The containers are packaged in 4 inner carry packs containing 24 containers in each (96/case). Each carry pack features handles that allow you to easily share the contents of a case with other departments or send them to other facilities. The packs will also help keep the containers organized on the benchtop. SPECIAL FEATURE! The cap on our 20mL containers (Item # 6518FL) has a "click" close design. Every time you close the container, you will hear an audible "click" indicating that the container is closed and ready to ship. This unique feature will be added to our 40mL and 60mL sizes in the next few months.